ARRL Headquarters will be closed November 22 and 23 in observance of Thanksgiving. There will be no W1AW bulletins or code practice transmissions those days. The ARRL Letter will be published a day early on Wednesday, November 21, but there will be no ARRL Audio News on Thursday, November 22. ARRL Headquarters will reopen Monday, November 26 at 8 AM Eastern Standard Time. We wish everyone a safe and bountiful Thanksgiving holiday. On November 16, ballots were counted in the races for Director in the Hudson Division and for Director and Vice Director in the Northwestern Division. This year, there were only three contested races for Director or Vice Director in the five Divisions holding elections. In the Hudson Division, Mike Lisenco, N2YBB, defeated incumbent Joyce Birmingham, KA2ANF, for the top slot in that Division. In the Northwestern Division, Jim Fenstermaker, K9JF, defeated William Balzarini, KL7BB, for Director, while James Pace, K7CEX, was elected Vice Director in a three-way race. Terms for Directors and Vice Directors begin at noon on January 1, 2013 and run for three years. Read more here. 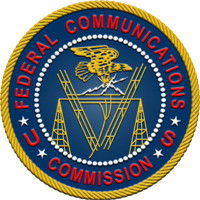 On Tuesday, November 20, the FCC released a Notice of Proposed Rulemaking (ET Docket No. 12-338) that proposes to amend Parts 1, 2, 74, 78, 87, 90 and 97 of the Commission's rules. 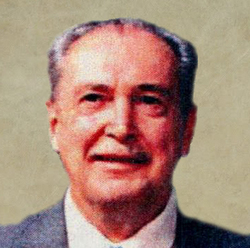 Part 97 governs the Amateur Radio Service. These changes will implement allocation decisions from the 2007 World Radiocommunication Conference (WRC-07) that concern those portions of the radio frequency spectrum between 108 MHz and 20.2 GHz and make certain updates to the rules in this frequency range. Most of the NPRM does not concern the Amateur Radio Service, but the FCC is requesting comments on the three parts that do: changing the allocation to the amateur portion of the 160 meter band, allocating a new Amateur Service band at 135.7-137.8 kHz and cleaning up the rules for the 10.0-10.5 GHz band. Read more here. NASA astronaut Sunita Williams, KD5PLB (back left), along with Russian cosmonaut Yuri Malenchenko, RK3DUP (front left) and Japan Aerospace Exploration Agency astronaut Akihiko Hoshide, KE5DNI (back, second from left), returned to Earth from the ISS on Sunday, November 18. 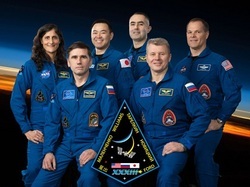 NASA astronaut Kevin Ford, KF5GPP (back right), and Russian cosmonauts Evgeny Tarelkin (back, second from right) and Oleg Novitskiy (front right) are part of Expedition 33/34; they launched to the ISS in late October and are scheduled to return to Earth in March 2013. Shortly before 9 PM EST on Sunday, November 18 (0200 UTC Monday, November 19), a Soyuz spacecraft carrying Expedition 33 Commander Sunita Williams, KD5PLB, and Flight Engineers Yuri Malenchenko, RK3DUP, and Aki Hoshide, KE5DNI, landed in the steppes of Kazakhstan, returning them safely to Earth from the International Space Station (ISS) after 127 days in space. While aboard the ISS, Williams, Malenchenko and Hashide completed 39 contacts with schools via the Amateur Radio on the International Space Station (ARISS) project. According to NASA ISS Ham Radio Project Engineer Kenneth Ransom, N5VHO, this ties with Expedition 15 for the fourth highest number of contacts. In 2011, Expedition 26 -- led by Scott Kelly -- set the record for having the most ARISS contacts at 73. Read more here. While Solar Cycle 24 is making the high bands the focal point for HF operators, 160 meters -- Top Band -- is still chock full of DX. There's no better time to get on 160 meters than the ARRL 160 Meter Contest, November 30-December 2. The ARRL 160 Meter Contest is an all-CW event, with ARRL/RAC Sections and DXCC entities used as multipliers. If you live in a rare Section -- such as North Dakota, Nebraska or any of the rare Sections from the November Sweepstakes contests -- everyone will be seeking you. Hams in Ontario (VE3) will have a new role in this year's contest: The split of Ontario into four new sections -- Ontario East (ONE), Ontario North (ONN), Ontario South (ONS) and the Greater Toronto Area (GTA) -- will give everybody a few new multipliers to hunt for on Top Band. Gene Shea, KB7Q, of Bozeman, Montana, logged more than 830 contacts and earned his Worked All States Award by the time the Sun rose on Saturday morning during the 2009 ARRL 160 Meter Contest. But being in Montana in December definitely means snow, and Shea had to clear the white stuff away from the base of the insulated 80 foot tower to make sure the 66 radials were still connected and ready to go. Read more about Shea's experience here. In this contest, Alaska (KL7) and Hawaii (KH6) can be worked by both DX and US/Canadian stations, as can the Caribbean US possessions (KP1-KP5) and all of the Pacific Ocean territories (KH0-KH9). No antennas for 160? Don't be discouraged! According to ARRL Contest Branch Manager Sean Kutzko, KX9X, if you don't have an antenna for 160, put up a temporary length of wire or try to load up whatever you have through an antenna tuner; even a 40 meter dipole through a tuner will make some QSOs. Since ARRL and RAC Sections are worth 2 points each and count as multipliers, the ARRL 160 Meter Contest is a good way to begin working -- or finishing up! -- your Worked All States Award (WAS). But don't forget about those DX stations -- each DXCC entity is a multiplier and is worth 5 points. The 2012 ARRL 160 Meter Contest runs from 2200 UTC Friday, November 30 through 1559 UTC Sunday, December 2. Complete rules and entry forms may be found here. Logs must be e-mailed or postmarked no later than 1600 UTC Tuesday, January 1, 2013. Paper logs should be sent to ARRL 160 Meter Contest, 225 Main St, Newington, CT 06111. Rod Newkirk, W9BRD, coined the term "Elmer" in 1971 as the conductor of the popular QST column "How's DX?". He passed away on November 19, 2012. 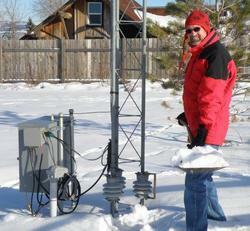 Rod Newkirk, W9BRD/VA3ZBB, of Ottawa, Ontario, Canada -- who penned the QST column "How's DX?" from 1947-1978 -- passed away on Monday, November 19 after a long illness. Newkirk was credited with coining the term "Elmer," as well as for his humorous take on DX in his column, especially with limericks in his DX Hoggery and Poetry Depreciation Society and the accompanying cartoons of Jeeves by Phil "Gil" Gildersleeve, W1CJD (SK). The term "Elmer" -- meaning someone who provides personal guidance and assistance to would-be hams -- first appeared in QST in Newkirk's March 1971 "How's DX?" column, where he wrote that "[t]oo frequently one hears a sad story in this little nutshell: 'Oh, I almost got a ticket, too, but Elmer, W9XYZ, moved away and I kind of lost interest.' Sure, the guy could have burned through on his own, maybe, but he, like others, wound up an almost-ham. No more Elmer. We need those Elmers. All the Elmers, including the ham who took the most time and trouble to give you a push toward your license, are the birds who keep this great game young and fresh." Newkirk was probably not trying to coin a term at the time, but the name stuck, becoming a general term for the mentors Newkirk called "the unsung fathers of ham radio." Read more here. Monte Simpson, K2MLS, of Bremerton, has been appointed ARRL Western Washington Section Manager, effective December 31, 2012. 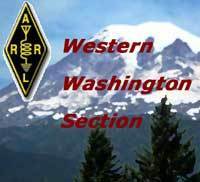 Membership and Volunteer Programs Manager Dave Patton, NN1N, made the appointment after current Western Washington Section Manager Jim Pace, K7CEX, was elected as ARRL Northwestern Division Vice Director on November 16. Pace has served as Western Washington Section Manager since October 2007. Read more here. The Sun, as seen on Thursday, November 21, 2012 from NASA's SOHO Extreme Ultraviolet Imaging Telescope. This MDI (Michelson Doppler Imager) image was taken in the continuum near the Ni I 6768 Angstrom line. The most prominent features are the sunspots. This is very much how the Sun looks in the visible range of the spectrum. Tad Cook, K7RA, reports: The strong solar activity continued this week. In last week's bulletin, the average daily sunspot number on November 8-14 was 104.9, but in the six days since then -- November 15-20 -- the average was 135.5, making for a nice increase. With the solar flux, the average over the previous period was 129.5, and in the six days since then, it increased to 138.6. 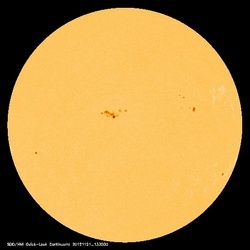 The latest prediction from NOAA/USAF on Tuesday, November 20, has the solar flux at 140 on November 21, 135 on November 22-23, 130 on November 24-25, 125 on November 26-27, 120 on November 28, and back down to 110 on November 29-December 1. The planetary A index is predicted to be 5 on November 21-22, 10 on November 23-24, 7 on November 25-26, and down to 5 on November 27-December 4. On November 19, Jon Jones, N0JK, in Wichita, Kansas reported fun on 6 and 10 meters: "I heard the W4CHA/b in grid square EL88 on 50.079 MHz via E skip around 1740 UTC. No live ops around. About 10 minutes earlier, I worked the PT0S DXpedition while on fixed mobile on 10 meters SSB. I was running 100 W and a mag mount whip antenna on the car. PT0S peaked up to 10 over S-9. I was on a high ridge with a clear shot to PT0S across the Wakarusa River Valley, which helped." Look for more on the ARRL website on Monday, November 26. For more information concerning radio propagation, visit the ARRL Technical Information Service Propagation page. The high altitude balloon video by Erin King, AK4JG, was the first place winner in 2012. Watch it here. 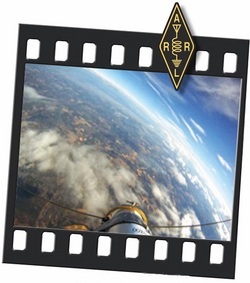 If you've ever wanted a way to show the world how exciting Amateur Radio can be, here's your chance: The ARRL is sponsoring its Third Annual Video Contest! Here's a chance to put that video camera to use: Shoot a ham radio-related video and send it our way. If your video takes first, second or third place, we'll post it on the ARRL website for everyone to see. We're looking for a few good videos (but only one per ARRL member, please) on any tasteful subject relating to Amateur Radio. Videos will be judged on overall quality and composition, and prizes will be awarded for first, second and third place. Read more here.